Peter Shilton, 125. His first appearance came in the 3-1 friendly victory against GDR at Wembley on 25 November 1970, and his last in the 2-1 loss to Italy in the third-place match at the World Cup finals on 7 July 1990. Shilton would have had many more caps had he not had to share England goalkeeping duties for a large part of his career, first with Gordon Banks and later Ray Clemence. Billy Wright, 70. The streak began in the 2-2 friendly draw with France at Arsenal Stadium on 3 October 1951 and ended in the 8-1 win against the USA at Wrigley Field in Los Angeles on 28 May 1959, which was Wright's 105th and last appearance for England. Wright was England's captain in all 70 matches of the streak. Billy Wright and Bobby Moore, 90. Steven Gerrard & Wayne Rooney 21. Stanley Matthews made his debut in the 4-0 win against Wales at Ninian Park in Cardiff on 29 September 1934 and his 54th and final appearance in the 4-1 victory over Denmark in the Idrætsparken in Copenhagen on 15 May 1957 in a career stretching over 23 years but interrupted by World War II's seven-year break in official international play. Matthews, the first England player to be knighted, also played for England in 29 unofficial wartime and victory internationals from 1939 to 1946. 53 - Wayne Rooney scored his fiftieth goal on 8 September 2015, a penalty against Switzerland. The first came on 6 September 2003 against FYR macedonia, cementing his place in history as England's youngest ever goalscorer. He overtook Bobby Charlton's record of 49 which had been held for 45 years. Wayne Rooney's 53 goals came in 43 different matches. Bobby Charlton's 49 goals came in 37 matches. Michael Owen's forty goals were scored in 33 matches. Gary Lineker's 48 came in thirty matches, and Jimmy Greaves' 48 goals was scored across 27 matches. Both Wayne Rooney and Bobby Charlton have scored across thirteen seasons. Michael Owen scored across ten seasons, whereas Jimmy Greaves, Kevin Keegan and Bryan Robson have scored across nine seasons. No one has held the top spot more than the six held by Steve Bloomer (1894-95 until 1907-07) and Gary Lineker (1985-86 until 1990-91). Alan Shearer held it in five consecutive seasons (1996-96 until 1999-2000). Michael Owen (2000-01 until 2007-08) also spent five seasons as leading scorer, as does Wayne Rooney (2003-04 until 2014-15). Four England players have scored five goals in a single match, each accomplishing the feat only once. They are Howard Vaughton, Steve Bloomer, Willy Hall and Malcolm Macdonald. Five England players have scored four or more goals in a match on two occasions. 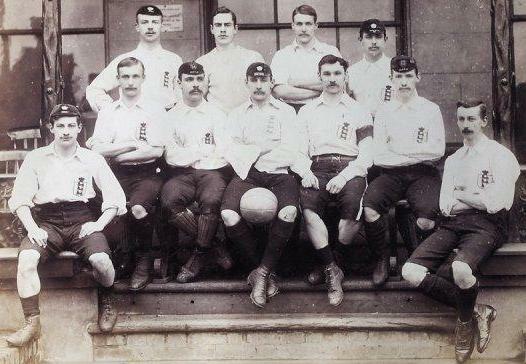 They are Steve Bloomer (one five-goal match included), Vivian Woodward, Tommy Lawton, Jimmy Greaves and Gary Lineker. Jimmy Greaves, six (two of four goals and four of three goals). Update: Tinsley Lindley, Cambridge University & Nottingham Forest, scored in what now appears to be only four consecutive England matches between 5 February 1887 and 4 February 1888. It was thought that he scored against Wales in 1886, but that has since been credited to Andrew Amos. It is also reported that he scored against Scotland in March 1888. But all contemporary match reports state that George Haworth was the scorer. If however, it is proven that he did score these two goals, he could have scored in nine consecutive matches. Tommy Lawton, Everton, did score in six consecutive appearances, his first, from his penalty-kick on his debut on 22 October 1938, until his scored against Italy on 13 May 1939. Jimmy Windridge, Chelsea, also scored in six consecutive matches between 16 March and 13 June 1908. Then five matches each for Fred Dewhurst (1887-89) and Bill Dean, his first five matches in 1927. The post-war record stands at five. Held by Tommy Lawton, from his four goals against Portugal, 25 May 1947, until his penalty-kick against Sweden, 19 November 1947. Nat Lofthouse scored from 25 May to 26 November 1952. Jimmy Greaves and Bobby Smith scored from 8 October 1960 until 15 April 1961. Wayne Rooney, from 9 October 2014 until 27 March 2015. A different record stands by those players that scored in consecutive matches in which they appeared. That particular record belongs to Steve Bloomer, who scored in his first ten appearances from 1895 to 1899. Second is George Camsell's nine (all his appearances), between 1929 and 1936. John Goodall scored six goals between 1891-95 as well as the aforementioned Windridge and Lawton's six between 1938 and 1939. Notes on the Mariner debate: some sources credit Paul Mariner with a post-war record on the claim he scored in six straight matches between the 2-0 victory over Netherlands at Wembley Stadium on 25 May 1982 and the 2-0 win against Czechoslovakia in Bilbao, Spain at the World Cup finals on 20 June 1982. But the day before Mariner scored in England's 4-1 win against Finland in Helsinki on 3 June 1982, another England team with an entirely different lineup drew 1-1 with Iceland in Reykjavík. The team that played Iceland was actually the England "B" team, but the Football Association yielded to the insistence of Icelandic football officials and recognized the Iceland match as a full international. Thus it cannot be said that Mariner scored in six straight England matches. Besides, he did not score against Czechoslovakia, that was a Barmoš own goal. Mariner also scored in England's 1-0 win against Hungary at Wembley on 18 November 1981, his last appearance immediately preceding the Netherlands match of 25 May 1982 since he missed the home internationals against Northern Ireland and Wales in February and April, 1982. What Mariner did do, then, was possibly score in the five, maybe six, straight matches in which he appeared, no mean feat although it is not the record. That particular record belongs to Steve Bloomer, who scored in his first ten appearances from 1895 to 1899, all played in the Home Championship. The post-war record is held by Wayne Rooney has scored in seven competitive appearances between October 2014 and September 2015. Beating the previous record by Nat Lofthouse, who scored in six competitive appearances between October 1952 and the World Cup Finals in 1954. Tommy Lawton of Chelsea scored the fastest England goal in history, 17 seconds after kickoff in the 10-0 friendly match victory against Portugal in Lisbon on 25 May 1947. The final whistle blew immediately after Phil Neal came on during stoppage time in the 3-1 victory against France in the opening group match at the World Cup 1982 final tournament in Spain. Against Slovakia in Bratislava in the European Championship preliminary match on 12 October 2002, Alan Smith came on during stoppage time with the ball out of play behind England's goal, and the final whistle blew immediately after David Seaman took the ensuing goal kick. Both players thus earned caps without ever touching the ball (although they may not be the only England players to achieve this). Jermain Defoe had scored seven goals in his 35 appearances as a substitute. Two. Although this has been achieved for as long as substitutes have been used. Nat Lofthouse, after he replaced Tom Finney, scored twice against Finland in May 1956. Tommy Taylor achieved the same achievement as a double-scoring substitute six months later in November. It was not until September 2008 that the same achievement was repeated when Joe Cole scored twice against Andorra. Since then, however, the achievement has been recorded on a further fiveoccasions. Jermain Defoe did it twice in 2009, against Andorra in June and against Netherlands in August. Peter Crouch against Egypt in March 2010. Adam Johnson against Switzerland in September 2010, and finally, Theo Walcott scored twice against San Marino on 5 September 2015. Teddy Sheringham scored immediately after he substituted for Robbie Fowler in the 68th minute of the 2-2 World Cup 2002 preliminary match draw with Greece at Old Trafford, Stretford, Manchester on 6 October 2002. He came on during the stoppage that followed a foul and scored on a header from David Beckham's ensuing free kick to bring England level at 1-1. Albert Sewell, the trivia expert who authors BBC Sport website's "Ask Albert" column, wrote: "It was certainly the fastest [goal] by a sub in British international football. We have checked and re-checked the tape, and can confirm that just 15 seconds elapsed from the time Teddy stepped on to the field and when his header crossed the goal line." David Beckham & Wayne Rooney have been sent off on two occasions. Ten other players share the distinction of one sending-off. Billy Wright and Tom Finney played in the 1950, 1954 and 1958 tournaments. Bobby Charlton and Bobby Moore appeared in the 1962, 1966 and 1970 tournaments. Peter Shilton, Terry Butcher and Bryan Robson played in the 1982, 1986 and 1990 tournaments. David Beckham and Sol Campbell appeared in the 1998, 2002 and 2006 tournaments. Ashley Cole and Joe Cole both appeared in the 2002, 2006 and 2010 tournaments. Frank Lampard and Wayne Rooney both played in the 2006, 2010 and 2014 tournaments. Bobby Charlton, Rio Ferdinand and Steven Gerrard are the only players named to four England World Cup squads, but they did not play on their first occasions, the 1958, 1998 and 2002 tournaments respectively. Ferdinand was named to the 2010 Finals squad, but withdrew following an injury. Peter Shilton holds the record with seventeen appearances. In Italy in 1990, and four players appeared in all seven matches: Peter Shilton, Des Walker, Gary Lineker and Chris Waddle. However, only Shilton and Walker played every minute of every match, 720 minutes in all, a number inflated by England's three extra-time matches. Lineker missed the last seven minutes of the first match, and Waddle, coming on as a substitute, missed 72 minutes of the last, third-place match. Peter Shilton made his seventeen consecutive appearances as goalkeeper in all England's matches at the 1982, 1986 and 1990 final tournaments. Billy Wright served as captain at three World Cup final tournaments, 1950 in Brazil, 1954 in Switzerland and 1958 in Sweden. Billy Wright, Bobby Moore and David Beckham each served as captain in 10 World Cup final tournament matches, Wright at the 1950, 1954 and 1958 tournaments, Moore at the 1966 and 1970 tournaments and Beckham at the 2002 and 2006 tournaments. Michael Owen was by far the youngest player ever to appear for England in the World Cup finals. He was 18 years, 183 days when he made a substitute appearance for England against Tunisia in the opening group match of the 1998 tournament in France. In the third group match, against Colombia, at the time, he became the youngest player to make a starting appearance for England at 18 years, 194 days. Peter Shilton was 40 years, 295 days when he played in the third-place match against host Italy at the 1990 tournament to earn his 125th and last cap for England. Gary Lineker is far and away England's top World Cup finals scorer with 10 goals in 12 matches, six in five matches at the 1986 tournament in Mexico and four in seven matches at the 1990 tournament in Italy. Geoff Hurst is the only player to score three in a World Cup Final match, England's 4-2 extra-time victory against West Germany on 30 July 1966. Two of his goals came in extra time, and one of those is highly controversial because of the dispute over whether it actually crossed the line. Gary Lineker was the first England player to score three goals in regulation time in a World Cup match, the 3-0 group stage victory against Poland on 11 June 1986. Lineker actually accomplished the feat in less than regulation time since he was taken off for a substitute at 84 minutes. Harry Kane, the second, was taken off after 63 minutes after he had scored three goals in a 6-1 victorious World Cup match against Panama on 24 June 2018. Gary Lineker set the England record with six goals in five matches at the 1986 tournament in Mexico, when he was the tournament's top scorer. Harry Kane, also scored six goals in his six matches in the 2018 tournament in Russia, when he was also awarded the Golden Boot. Gary Lineker scored in four consecutive World Cup finals matches, England's last three at the 1986 tournament in Mexico against Poland, Paraguay and Argentina and their first at the 1990 tournament in Italy against the Republic of Ireland. David Beckham is the only player to score in three tournaments, in the 1998, 2002 and 2006 tournaments. Bryan Robson scored after 27 seconds against France on 16 June 1982 in the opening match of the preliminary group phase of the World Cup final tournament in Spain. Michael Owen was by far the youngest England player to score at the World Cup finals when he came on as a substitute and temporarily brought England level with Romania in the second group match at the 1998 tournament in France. He was 18 years, 190 days. Tom Finney became the oldest player to score for England in World Cup finals play when he put home a penalty kick against the USSR in the opening match at the 1958 tournament in Sweden. He was 36 years, 64 days. Finney is also the oldest to score from open play, scoring in the quarter-final against Uruguay at the 1954 tournament in Switzerland when he was 32 years, 82 days. Three seperate players - Ray Wilkins was shown the red card for incurring two cautions in one match against Morocco at World Cup 1986 in Mexico, David Beckham for violent conduct against Argentina at World Cup 1998 in France and Wayne Rooney for an alleged stamp against Portugal at World Cup 2006 in Germany. Three cautions - Ray Wilkins incurred his first against Spain at World Cup 1982 and two more against Morocco at World Cup 1986, which earned him a red card and suspension from the following two matches. Terry Fenwick was also given three cautions in three separate matches at World Cup 1986, the first against Portugal, the second, against Poland, which brought him a one-match suspension, and the third against Argentina in England's last match of the tournament. Terry Fenwick's three cautions at the 1986 tournament, drawn in the matches against Portugal, Poland and Argentina, remain the record. Steven Gerrard had played in three tournaments, 2000, 2004 and 2012. Wayne Rooney joined him when he appeared in his third tournament in 2016, following his appearances in 2004 and 2012. Wayne Rooney played in ten matches across his three tournaments, whereas Steve Gerrard had made only nine appearances across his three tournament appearances. England have appeared in the European Championship final tournament nine times and each time have had a different captain. The eight players who have served as captain are Bobby Moore, 1968 in Italy, Kevin Keegan, 1980 in Italy, Bryan Robson, 1988 in West Germany, Gary Lineker, 1992 in Sweden, Tony Adams, 1996 in England, Alan Shearer, 2000 in The Lowlands, David Beckham, 2004 in Portugal, Steven Gerrard, 2012 in Ukraine/Poland and Wayne Rooney/Gary Cahill, 2016 in France. Tony Adams appeared as captain in five European Championship final tournament matches, all in 1996 in England. Marcus Rashford, when he came on as a substitute against Wales, on 16 June 2016, was 18 years and 229 days old. When Wayne Rooney of Everton started England's game against France in the European Championships 2004 in Portugal, he was 18 years old and 233 days, making him the youngest England player to start in this tournament. Alan Shearer scored 5 goals in the European Championships 1996 in England, 1 against Switzerland, 1 against Scotland, 2 against Netherlands and 1 against Germany. Everton's Wayne Rooney scored the first of his four goals in The European Championships 2004 against Switzerland on 17 June 2004. He was 18 years, seven months and 24 days old. For 4 days, he was the youngest player ever to score in the Tournament. Switzerland's Johan Vonlathen was 18 years, five months and 19 days on 21 June 2004.